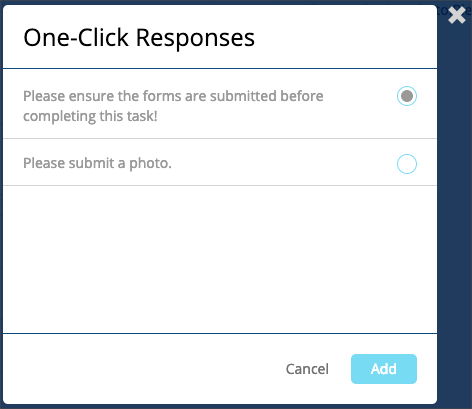 We have developed a new reply feature called One-Click Response (OCR) to make it easier for administrators to reply to task messages. OCR, one of the latest enhanced features of task chat, aims to provide administrators with a one-click chatting experience by offering pre-configured responses. An OCR button will only appear in a task chat based on selected categories. By selecting the button it will display a maximum of five pre-configured chat messages. Once it is selected you can still modify the message in the chat field before sending it. OCR can be configured under the Category Management on the Configuration Module page. Each OCR message can appear multiple times by choosing different levels of categories. At any time, you can edit or delete messages to reflect the most relevant replies. You can now click on each task title from the callout window when you hover over a task name to open the details page. A loading spinner will visually display how much percentage has been progressed when downloading multiple attachments. The Category Builder will now appear under the Category Management card. The Import from CSV tool will now overwrite existing location data based on a location’s store code. If the location.csv file contains a unique store code then a new location profile will be created. The Update Columns button will properly appear on smaller non-mobile screen devices. Assignees’ email addresses will appear on the task-assignee confirmation page along with their full name.